The Dominican Sisters of Mary, Mother of the Eucharist, have recently published a Manual for Marian Devotion. The Manual is meant to be a tool to nourish love of Mary with the Scriptures, stories of the saints, prayers, devotions and more. It’s divided into two parts. Part One lays the framework for understanding the Church’s veneration of Mary, and Part Two is a rich resource of devotional material to nourish private devotions to the Mother of God. This excerpt provided to ZENIT is from the chapter on Mary’s role in God’s plan and focuses specifically on Mary in the New Testament. The original cell of all redeemed mankind is Mary, in whom first took place the purification and sanctification through Christ and impregnation by the Holy Spirit. Before the Son of Man was born of the Virgin, the Son of God conceived of this very virgin as one full of grace, and He created the Church in and with her. Mary’s place is at the center of God’s plan. Christ’s story is hers; she is mother to God’s people. As we enter more deeply into the mystery of Christ’s life, death, and resurrection, we find Mary walking before us. She is the one chosen from all eternity to bring God’s Son into the world, and she is the perfect believer who teaches us to love her Son. In the Gospels, Mary’s role, dimly hinted at in the Jewish Scriptures, comes into full light. At the Annunciation, the angel Gabriel approaches Mary to ask her to be the Mother of God’s Son. He addresses her not by her name but by a title, “Hail, full of grace, the Lord is with you!” (Lk 1:26). This title points to her unique holiness: Mary already shares in the fruits of Christ’s redemptive death. The annunciation invites Mary to obedience and faith, and she responds wholeheartedly. With her “ fiat,” her “Let it be to me according to your word” (Lk 1:38), she receives the Word of God into her heart and the Son of God into her womb, truly becoming the Mother of God. As others come to believe in Christ, they share in Mary’s faith, which remains at the heart of the Church. The first action Mary takes after accepting the Word into her body is to bring Him to her cousin Elizabeth. This mission of mercy to her elderly cousin teaches us that our proximity to Christ should always issue forth in apostolic zeal. The exchange between the two pregnant women has inspired beautiful meditation and art over the centuries. Little John leaps for joy within Elizabeth’s womb, and Elizabeth exclaims, “Why is this granted me, that the mother of my Lord should come to me?” Church Fathers such as St. Ambrose saw this as the moment when John received grace through the physical proximity of his God. The similarity of language between this passage and 2 Samuel 6, where David asks “How can the ark of the Lord come to me?” and later dances before the ark, suggests Mary as the new Ark of the Covenant. In response to Elizabeth’s greeting, Mary pours forth the Magnificat, a song of praise that is today enthroned like a jewel among the readings and prayers that make up the Church’s daily Evening Prayer. In the Magnificat, Mary prophesies that her unique role will give joy to many believers through- out the centuries: “For behold, henceforth all generations will call me blessed; for he who is mighty has done great things for me, and holy is his name” (Lk 1:48–49). From her time forward, all those who praise the Lord for saving His people will bless the name of Mary. Mary’s motherhood of Christ is the central mystery of her role in God’s plan, yet from this flows a continuing cooperative role. Mary cooperates in God’s plan when she watches over Jesus throughout the many years of her hidden life in Nazareth. We know very few details of the Holy Family’s life during this period, but the Gospels tell us that Joseph worked as a carpenter and that Christ was “obedient” to him and to Mary (Lk 2:51). These two likewise lived in obedience to the Jewish law, presenting their infant Son in the Temple after forty days—as prescribed in Exodus 13 and Numbers 18—and travelling to Jerusalem for the various annual feasts. It was on one of these trips, when He was twelve, that Jesus stayed behind in Jerusalem without His parents’ knowledge, displaying unusual wisdom as He discoursed with the scholars of the law in the Temple. Meanwhile, with an anguish that prefigured Mary’s suffering during the three days following Christ’s death, she and Joseph searched for their Son. Sin distances us from Christ, and Mary, though sinless, also experienced the pain of losing Him. Upon their reunion, Jesus returned with His parents to Nazareth. During the “hidden years” of work and family life in this small town, Mary represents the patience of the Church, who, in turn, patiently encourages the growth of Christ’s life in her members. At the wedding at Cana, it is her petition to Jesus to remedy the lack of wine that signals Him to begin His public ministry of healing and teaching. This ministry will culminate in Christ’s redemptive death and resurrection. The link between the two episodes is highlighted by Christ’s addressing her in both instances as “woman” (Jn 2:4, 19:26). As at Cana, Mary continues to encourage us to “do whatever He tells” us. Whenever we follow her advice, Her Son transforms the ordinary water of our feeble human efforts into wine, abundant, delightful, and exhilarating. Mary’s faith shines most brightly when she stands beside Jesus at the foot of the cross. Here, Mary offers her own sufferings in union with Christ’s for the salvation of all peoples. Christ, looking down on her, sees the fruit of His redeeming death already before Him. He entrusts John, His beloved disciple, to Mary, saying to her, “Woman, behold, your son!” and to John, “Behold, your mother!” (Jn 19:26–27). With this, Jesus gives His mother to be a mother to the whole Church, a maternity she exercises through the merits of her suffering, as well as through her prayer and presence. The Scriptures are silent about Mary’s experience of Christ’s resurrection, but fifty days later, the Apostles are gathered with her in the upper room as they await the Spirit promised by Christ (Acts 1:14). With what anticipation must she have awaited their experience of the Spirit who had filled her womb with the Creator of the universe! At Pentecost, the Church receives that same Spirit as the beginning of its mission to preach the Gospel. Mary does not go forth to preach like the Apostles but remains a source of strength and faith at the heart of the Church. Mary appears again in the Book of Revelation, “a woman clothed with the sun, with the moon under her feet, and on her head a crown of twelve stars” (Rv 12:1). The “woman” of Revelation births a son who will rule the nations. She continues to exercise her motherly concern as many other children join the cosmic struggle between Christ and Satan. The twelve stars adorning her crown represent both the twelve tribes of Israel and the twelve Apostles, whose preaching crowns the Church, of which she is the model. Taken up by Christ into heaven, she remains engaged in the struggle of the Church militant. Excerpted from MANUAL FOR MARIAN DEVOTION by The Dominican Sisters of Mary, Mother of the Eucharist Copyright © 2016 by TAN Books. Excerpted by permission of TAN Books, a division of Saint Benedict Press. All rights reserved. No part of this excerpt may be reproduced or reprinted without permission in writing from the publisher. 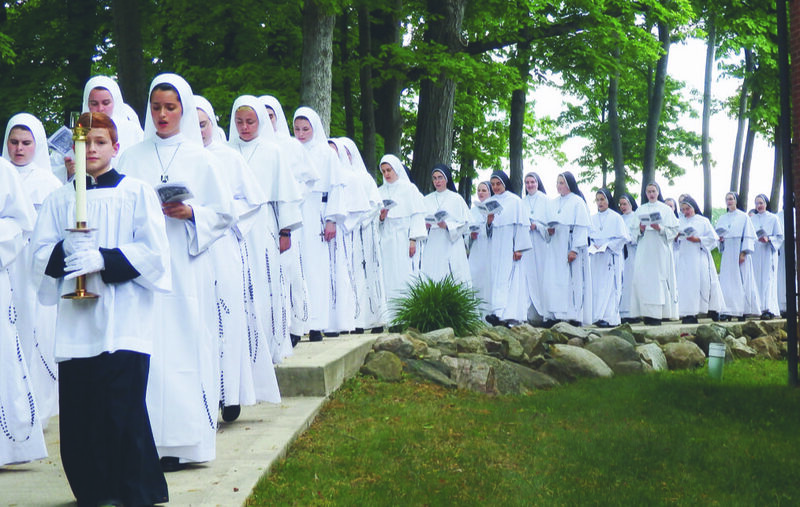 The Dominican Sisters of Mary, Mother of the Eucharist were canonically established in 1997 and have joyfully taken their messages of faith to the modern world through education, television and music, to name a few of their outreaches. With over 130 Sisters and an average age of 30, they teach in preschool through college all over the United States; their Motherhouse is located in Ann Arbor, Michigan. They also serve as librarians at the North America Seminary in Rome. Several of the Sisters have been guests on The Oprah Winfrey Show more than once and made it to the finals of the Game Show Network’s The American Bible Challenge. The Sisters have released two international albums, to wide acclaim including reaching No. 1 for several weeks on Billboard’s Classical Traditional Chart. Their open spirit has unexpectedly attracted widespread international media coverage. Most recently the Sisters made headlines for reaching one million likes on their much beloved Facebook page.